Boss of the gorilla pack. He was against letting Tarzan join the group, but Kala's resolve won him over. Kerchak worries that Tarzan's contact with people will bring danger to the gorilla community. Kerchak is Tarzan's adoptive father and the leader of a family of gorillas that reside in Deep Jungle. He is very reluctant to trust humans and other outsiders, as demonstrated by his encounter with Sora, Donald, and Goofy. When Sora, Donald, and Goofy meet Kerchak, his distrust of outsiders causes him to treat them rather coldly. He even ignores Tarzan's request to take them to the waterfalls. However, after Sora and company save the gorillas from Clayton, Kerchak lets them into the waterfalls, where Sora seals Deep Jungle's Keyhole. Kerchak is an adult male gorilla with black hair and grey skin. His forearms are enormous and his head is quite large, as well. His eyes are brown and small in comparison to the rest of his head. "If you want Kerchak to like you, stay away from him!" Kerchak is brave, powerful, and loyal. He cares a great deal about the gorilla family he leads, but his cold disposition gained after the death of his son causes those he loves to fear him. 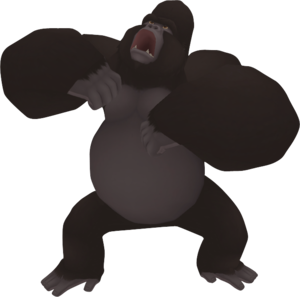 Kerchak also has a great hatred-like fear of outsiders of any kind, reacting aggressively when they are near. He is not without a heart, however; he is kind and almost loving to those he trusts, even towards outsiders that have gained that trust. Kerchak first appeared in Disney's 1999 animated film, Tarzan. Leader of a large family of gorillas, he is heartbroken when his only offspring is killed by the leopard Sabor. When his mate Kala brings the orphaned Tarzan into the family, he immediately orders her to take him back because of his fear of humans. He also tells her that Tarzan could never replace the child they had lost. Kerchak reluctantly allows Tarzan to remain amongst the gorillas in the end, but he does not consider the boy his son. His dislike for Tarzan only grows as the boy ages into a man, but the tension between the two dissipates when Tarzan kills Sabor and offers the leopard's body to Kerchak. Tarzan earns Kerchak's respect, but this is destroyed when Tarzan allows other humans (Jane, her father Professor Porter, and Clayton) to see the gorilla family against Kerchak's orders. Kerchak attacks the humans to protect his family, but Tarzan tackles the silverback and holds him down so that his new friends may escape unharmed. Tarzan decides to return to London with Jane after Kerchak accuses him of betraying his family, but he is captured by Clayton and his band of thugs. Clayton goes back to the jungle to hunt down the gorillas, and as his thugs round them up and put them in cages, he manages to capture Kerchak, claiming he would be "better off stuffed". Tarzan returns along with Jane and Professor Porter to rescue his ape family, an action that touches Kerchak's heart. Kerchak defends Tarzan bravely, but he is shot by Clayton. After defeating Clayton, Tarzan approaches the wounded silverback, who makes amends with him and makes him his successor. Kerchak finally accepts Tarzan as his son, dying in his arms. This page was last edited on 2 May 2018, at 23:14.